SUMMARY: We present a case of a 28-year-old woman with a cerebellopontine angle and prepontine cistern epidermoid cyst with unusual signal intensity. She presented with cranial nerve neuropathy and unsteady gait. MR imaging showed a tumor mass with central area of hemorrhage and a focal area of heterogeneous signal intensity with spotty enhancement, which correlated histologically to old blood in a cystic lumen and granulation of a cystic wall, with a large area of hemorrhage and mild vascularity. 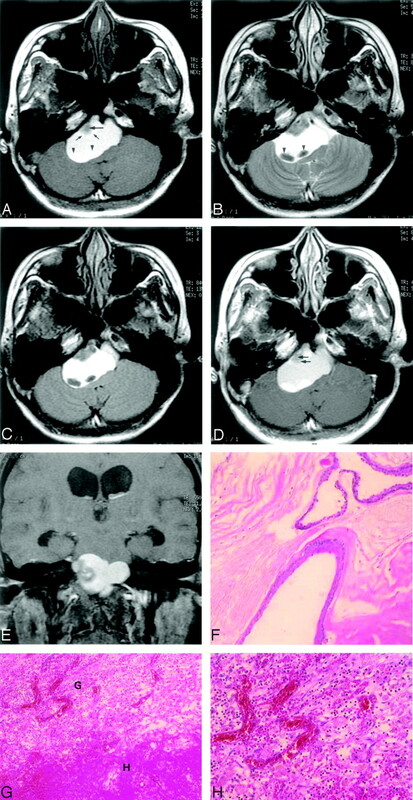 Epidermoid cyst, or pearly tumor, is congenital in origin and accounts for about 1% of intracranial tumors.1 It is a benign extracerebral intradural lesion and in about 40% of cases is located in the cerebellopontine angle.2 Because of their avascular nature and composition with cholesterol in a solid crystalline state and keratin within the tumor,3,4 epidermoid tumors typically have long T1 and T2 relaxation times and have no enhancement on postcontrast MR images. We present a case of an epidermoid tumor with spotty enhancement and uncommon MR imaging signal intensities in 3 different areas of the lesion. These MR imaging findings correlated well with histologic findings. A 28-year-old woman reported headache for 1 year. She had experienced severe dizziness, vertigo, and unsteady gait during the preceding 3 months. She also reported double vision when she looked to right side and experienced a choking episode 1 month earlier. Neurologic examination showed partial ptosis and partial facial palsy on the right side, tongue deviation to the right, hypoesthesia of the left upper trunk, and tandem gait impairment. There was no history of trauma. MR imaging of the brain revealed an extra-axial, lobulated soft-tissue mass, measuring 48 × 30 × 36 mm, in the right cerebellopontine angle and prepontine cistern (Fig 1A–D). Mild pressure erosion of adjacent petrous bone and partial encasement of the basilar artery were noted. Most of the lesion had homogeneous hyperintensity on both T1-weighted and T2-weighted images and remained hyperintense on fat-saturated T1-weighted image (Fig 1E). In the dependent portion, 2 oval shapes with hyperintensity on T1-weighted and dark signal intensity on T2-weighted images were noted. There was a small area, about 1–1.5 cm in diameter, with apparent heterogeneous hyperintensity to hypointensity on T1-weighted images, heterogeneous hypointensity on T2-weighted images, and spotted enhancement on postcontrast images on the anterior and lateral aspects of the lesion (Fig 1C). A crescent zone surrounding this area, with hyperintensity on T1-weighted and hypointensity on T2-weighted images, was clearly delineated. Marked compression of the brain stem and obstruction of fourth ventricular outlets, causing hydrocephalus, were noted. Our initial diagnosis was a rare skull base tumor such as chordoma with posthemorrhagic change. A 28-year-old woman with posthemorrhagic epidermoid tumor. A, Axial T1 noncontrast-weighted fast spin-echo MR image (1823.5 milliseconds/7.4 milliseconds /2/750 milliseconds [TR/TE/excitation/TI]) shows a well-defined hyperintense extra-axial mass in the prepontine area and right cerebellopontine angle. Homogeneous hyperintensity is noted in most parts of the lesion. There is a focal area of heterogeneous intensity in the anterolateral aspect with hypointensity at the middle (arrow) and a crescent hyperintense portion at the periphery (small arrows). There are 2 oval shapes with hyperintensity in the dependent part of the lesion (arrowheads). B, Axial T2-weighted fast spin-echo MR image (3500 milliseconds/86 milliseconds/2 [TR/TE/excitations]) shows the hyperintense lesion has a CSF equivalent signal intensity along with focal areas of heterogeneous hypointensity and 2 areas of homogenous hypointense signal intensity (arrowheads). C, Axial fluid-attenuated inversion recovery MR image (8402 milliseconds/135 milliseconds/0.5/2100 milliseconds [TR/TE/excitation/TI]) shows no signal intensity drop in the lesion, and a clear border between the mass and CSF space is seen because the water signal intensity has been suppressed. D, Axial contrast-enhanced T1-weighted fast spin-echo MR imaging image (450 milliseconds/9 milliseconds/2 [TR/TE/excitation]) of the same level shows faint enhancement (arrows) of the anterior nodule (compare with panel A). E, On coronal T1-weighted, fat-suppressed contrast-enhanced MR imaging image, the hyperintensity within the lesion is not suppressed. Hydrocephalus with bilateral temporal horn dilation is noted. F, Photomicrograph of the lesion specimen. The cyst is lined by keratinizing squamous epithelium and filled with lamellated keratinous debris. (hematoxylin-eosin [[H&E] stain; original magnification ×100). G, Photomicrograph of the lesion specimen. Hemorrhage (H) with surrounding granulation tissue (G) made up about 25% of the specimen volume. (H&E stain; original magnification ×100). H, Photomicrograph of the lesion specimen. Mild vascularity, with capillary sized vessels, was seen in the granulation tissue. (H&E stain; original magnification ×200). Surgery was performed 2 days later. During surgery, a soft, well-capsulated greenish cystic mass was seen in the right cerebellopontine angle and prepontine region, composed of a solid mural nodule abutting the posterior aspect of the petrous bone and containing old hemorrhage with mudlike debris in the dependent portion. Cranial nerves 9, 10, and 11 adhered to the tumor and the tumor was dissected from these nerves. The tumor was almost completely removed. Cytology of the cystic content revealed squamous cells and hemosiderin-containing macrophages. Microscopically, the wall of the cystic tumor was lined by squamous epithelium and keratin content (Fig 1F). Rupture with foamy histiocyte infiltration and foreign body giant cell reaction, hemorrhage with cholesterol cleft, and focal microcalcification were noted. Collapsed cystic lining, separate keratin content, and blood and hemorrhage with surrounding granulation made up about 25%, 50%, and 25% of the specimen volume, respectively (Fig 1G). Mild vascularity, with capillary sized vessels, was seen in the granulation tissue (Fig 1H). Histologic diagnosis was compatible with an epidermoid cyst with intracystic hemorrhage. After surgery the patient experienced sudden onset of high-grade fever, probably due to chemical meningitis. The fever subsided after steroid treatment. The patient was readmitted 2 weeks later because of bulging of the surgical flap. Craniectomy with evacuation of CSF hygroma was performed. The patient was discharged after remission of headache, dizziness, and double vision. The patient did well during 12 months of follow-up. In our case, intracystic hemorrhage caused a high signal intensity on both T1- and T2-weighted images because of the paramagnetic effect of heme iron (Fe3) in methemoglobin and other hemoglobin breakdown products. The focal thickening of the cyst wall as a mural nodule on the anterolateral aspect had an irregular thick rim of high to low signal intensity on T1- and T2-weighted images and a core area of low signal intensity on T1- and T2-weighted images. This may be due to the mixture of keratin with differently aged hemorrhage and granulation tissue, as documented on our histology. Because of the avascular nature of epidermoid cysts, hemorrhage within the tumor is rare and there are only isolated reports in the literature.1,10,14 These tumors show either hyperattenuation on CT scan1,10,14 or hyperintensity on both T1-weighted and T2-weighted images.1,10 One of them showed an obvious enhanced part on contrast-enhanced T1-weighted images. Microscopically, it showed foamy cells, granulation, and foreign body granulation with moderate vascularity.10 Our patient had similar pathologic change. We presume that the epidermoid in our case had previously developed leakage resulting in foreign body granulation formation. Intracystic hemorrhage probably developed from this granulation tissue. The hemosiderin-laden macrophages found in the cyst contents may indicate a more chronic process, and the spotty enhancement of the cyst wall probably corresponds to the mild vascularity in granulation. The differential diagnosis of a posthemorrhagic cystic mass in the cerebropontine angle can be cystic schwannoma, cystic meningioma, and arachnoid cyst. A purely cystic schwannoma is very rare and can have an appearance similar to epidermoid tumor on MR imaging images. Findings of extension into the internal auditory canal and strong enhancement of the cyst wall may help to diagnose schwannoma. Epidermoid cysts typically show undulating margins and model their shape to conform to the cerebropontine angle. The cyst has a tendency to insinuate itself around the nerves and blood vessels in the cerebropontine angle. They usually do not enhance with gadolinium and do not bleed. From a practical point of view, recognition of this case as a hemorrhagic epidermoid cyst is important. Although surgery would have been performed on this patient anyway, chemical meningitis could possibly have been avoided if surgeons had recognized it before surgery. In our case of an epidermoid tumor that showed variable signal intensity on T1- and T2-weighted MR images in different parts with spotty enhancement, a mixture of hemorrhage and surrounding granulation with mild vascularity in the cystic wall and intracystic old hemorrhage could explain the unusual MR imaging appearance. Accepted after revision March 31, 2005.